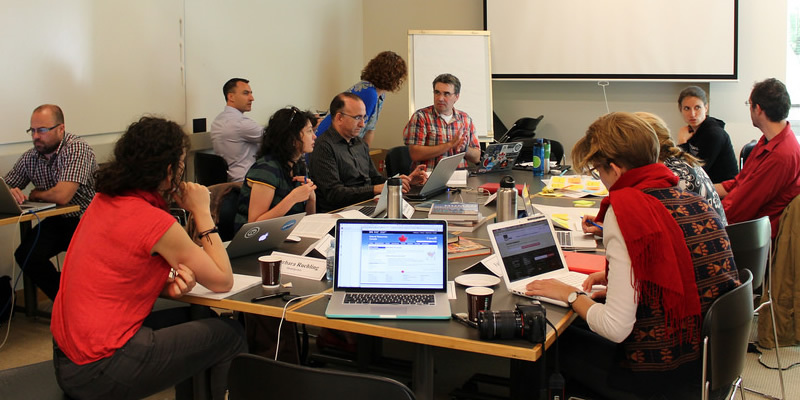 Over the course of four days in June 2014, five Geography faculty members from across British Columbia, supported by a facilitator, librarian, researcher, illustrator, programmer and instructional designer, created this book. This involved drawing on our own research, teaching and experience and working with the team to put it all together into an online format, one that would be accessible to students and educators alike. Beyond the unique way in which this book was created through this Book Sprint process, there are other elements of this book that make it unique. First, it takes a holistic approach to first-year Geography, incorporating elements of physical, human and regional geography, as well as bringing in methods and perspectives from spatial information science. Pedagogically, this book is aimed at a a first-year or introductory Geography student, and would be suitable for a first-year Geography course on BC. It incorporates elements of service learning and suggested service learning activities recognizing that the study of Geography is deeply connected to the communities we live in. Many of the suggestions for service learning are illustrated through the use of case studies from across BC. Finally, this book is openly licensed with a Creative Commons license, meaning that it can be freely used, copied, distributed, adapted and modified, either in whole or in part without further permission. We have made this book available in numerous file types that you can take, modify and reuse. Your reuse of this material can be anything from simple copying and using a single illustration or image to a complete rewriting of the book to fit your own learning objectives. BCcampus Open Education began in 2012 as the B.C. Open Textbook Project with the goal of making post-secondary education in British Columbia more accessible by reducing student costs through the use of openly licenced textbooks and other OER. BCcampus supports the post-secondary institutions of British Columbia as they adapt and evolve their teaching and learning practices to enable powerful learning opportunities for the students of B.C. BCcampus Open Education is funded by the British Columbia Ministry of Advanced Education, Skills & Training, and the Hewlett Foundation. Open textbooks are open educational resources (OER) created and shared in ways so that more people have access to them. This is a different model than traditionally copyrighted materials. OER are defined as teaching, learning, and research resources that reside in the public domain or have been released under an intellectual property license that permits their free use and re-purposing by others. Our open textbooks are openly licensed using a Creative Commons licence, and are offered in various e-book formats free of charge, or as printed books that are available at cost. If you are an instructor who is using this book for a course, please fill out our Adoption of an Open Textbook form. About the Book by Geography Open Textbook Collective is licensed under a Creative Commons Attribution 4.0 International License, except where otherwise noted.